Mickey Flynn’s six-year-old daughter disappeared eleven years ago while sledding in the centre of the Massachusetts town of Belham, and while Mickey was supposed to be watching her. Now divorced and struggling with alcoholism, Mickey is still finding it difficult to accept the fact that Claire is gone. The prime suspect in her disappearance is defrocked Catholic priest Richard Byrne, a man who is now dying of cancer and who still refuses to tell anyone what he did with Claire and the other girls he has been accused of snatching. 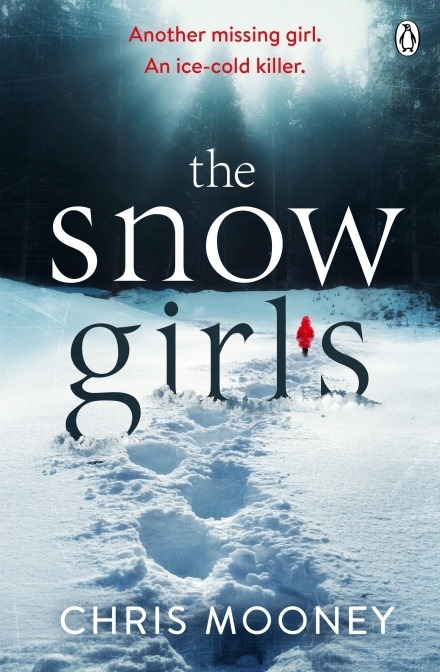 When Byrne asks for Dr Darby McCormick, hopes are raised that he’s finally about to put the families of these young girls – the Snow Girls, as they have become known – out of their misery. But as Darby returns to her hometown, she finds herself drawn deep into the mystery and Richard Byrne’s continued silence on the subject. 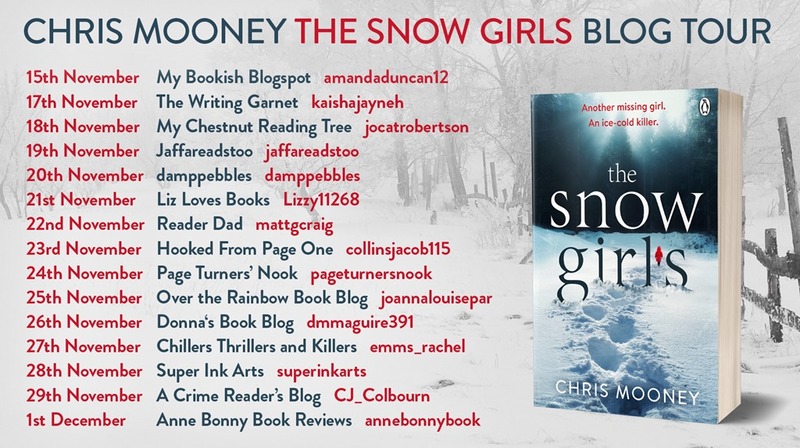 The Snow Girls is the eighth book in Chris Mooney’s series featuring forensic scientist/psychologist-turned-private detective Darby McCormick, and it’s the first in the series that I have had the pleasure of reading. Despite the long-running series, The Snow Girls is an excellent place for new readers to jump into McCormick’s world, the old history reawakened by her homecoming making more recent history that might have been covered in previous volumes less important, certainly to the story at hand. McCormick herself is a solid and lifelike central character, and it doesn’t take long for the reader to decide whether we like her or not (I’m guessing for most of us, it’ll be a big thumbs-up). While Mooney touches on more recent events in her life, the return to Belham, and the interactions with Mickey Flynn – who, we discover early on, is the man to whom Darby lost her virginity – give us a good idea of who Darby is, and what values we might expect her to hold. From the outset it’s clear that she’s a thick-skinned, no-nonsense operator, whip-smart and stubborn as a mule. In contrast, Richard Byrne is cold and calculating, a man who oozes evil – in the most mundane sense of the word – and leaves everyone around him feeling uncomfortable. While his guilt in the case of Claire and the other Snow Girls is never anything other than “alleged”, the reader – along with many of the characters – will sense his guilt from the moment we first meet him. With recordings of confessions from his time as a practising priest, and stories to tell about everyone in the area – including Darby’s own mother – it’s clear this is a man who enjoys any power that he can use to make others feel inferior or afraid. We can understand how Mickey Flynn has already almost beaten him to death, even though Byrne’s death could mean the end of any slim chance there might be of finding out what happened to Claire, and his proposition to Darby during their first meeting comes as no surprise, leaving us with the sense of an unnatural, uncomfortable chill. If Richard Byrne is not the most evil non-supernatural character you’ve ever encountered in fiction, he’s certainly up there with the best of them. Unlike most series thrillers of this kind, Mooney shifts focus from one character to another as the story progresses, so that we don’t see everything through the eyes of Darby McCormick. This keeps the story fresh, and allows us to see a much bigger picture than if Darby was our primary source of information. It’s a fast-paced tale that builds momentum as it approaches a very satisfying – and somewhat surprising – climax. It’s a well-written tale that doesn’t rely too heavily on the familiar PI clichés and which offers a fresh perspective on a long-running investigation, and the impact it has on the lives of the victims’ families, and of the town in which they live. Chris Mooney has found the perfect lead character in Darby McCormick and balances the intensity and frustration of a long-stalled police investigation with a humour that allows us to see Darby and those around her as real people. While The Snow Girls marks my first encounter with Darby, it certainly won’t be my last. A top-notch psychological thriller, this is a series that deserves a wider audience, and should be top of the list for people looking to fill the gap inevitably left when finished reading the latest Reacher, or Warshawski, or Brennan, or Cross. Mooney’s work stands up well alongside these legends and Darby McCormick might just be your new favourite series character.